yeah I like that. I agree that ..time permitting..it looks best all toned. and if not all toned..all black and white. Yeah. I'm taking the toned approach. I had forgotten how easy it is to do using the zip-a-tone stuff in Manga Studio. Four pages down for me. About 5 or 6 to go. ALSO, everyone..PLEASE put your name on the top of your pages or SOMEwhere on them, so we can see/know WHO is doing them. as I keep putting up the pages from the original project and several that I don't know who did them, it will help us all. thanks guys!!! I have 4 or 5 thumbnailed out. Hellboy vs Wolfman, very simple encounter. I'm discussing another story with DavidNH, and it's pretty cool... if we manage to get it right, it'll blow your minds. Not kidding. 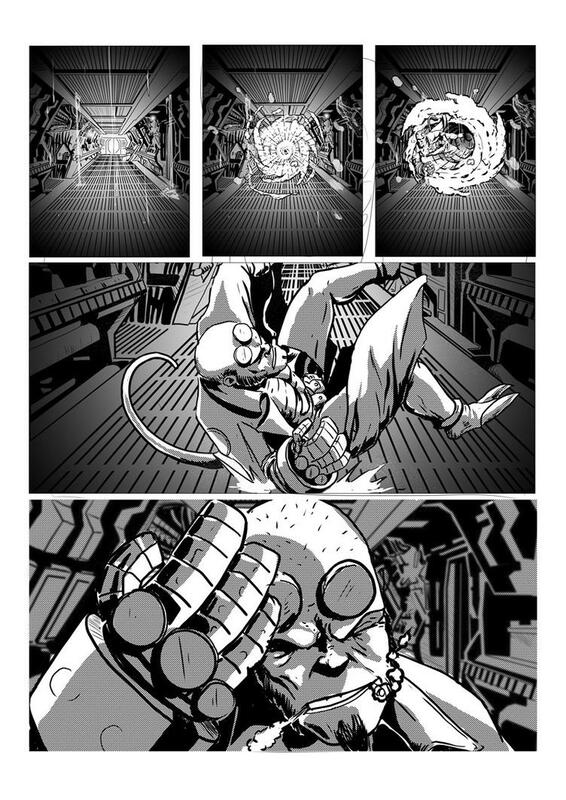 I wanted to ask - the way I'm scripting both my shorts, Hellboy's cracking a few (subtle) meta-references about the portal and the dimensions he's being pulled through. He's also expecting the portal to show up and is ready for it. I figure we could put the two stories towards the end, which would explain why he's getting used to the situation a bit. Does that work? And a suggestion about the name thing: Since every person/team is working on their own story, why not do a proper credits panel for each short, like they do in published anthologies? I named both my stories, too ("HELLBOY & HULK: MONSTERS", and "THE DEMON'S WHISPER"). I picked one splash panel in each and put the title and credits in. That way it's easy to keep track of who did what. Maybe we could even do a proper Contents Page in the Beginning. Nothing fancy - just the title of each short and the name of the person/team that did it. Hey, if we're doing this, why not go all out. I think it's more cohesive to have one title for the entire "book". The portal isn't pulling HB into another story, but another section/chapter of the ongoing portal-hopping story. I think a credits box makes sense (especially where more than one person is working on it), but Rob really needs the submitters name on each page somewhere. I think its fine if everyone wants to put their own “title” on their story. It makes sense. But i also want the title for the whole book on the cover. We can space out placement of the twins stories no problem. The portal hellboy is in is something he was forced into and cant control, but i did throw in a small element that he does that disrupts the randomness of the portal which leads indirectly to it sending him different places. So conceivably it could be less chaotic the more jumps he makes. And I love the idea of a proper inside cover credits page. If someone knows how to make one that looks good. Cause i sure dont. Yes...everyones names on the pages. This is a big deal and will ne needed. The portal isn't pulling HB into another story. I know. Not what I meant. ^ That's what I meant. An overall title for the whole book, but since every interaction is with different characters (in different worlds) and thus more or less its own mini-story, a smaller title each wouldn't be unwarranted. Anyone think they can write a decent portrayal of the Goon? I can pencil / ink it from there with a little writing help. Looking to do about 5 pages to contribute. PM / Reply if you are ready to team-up! Hellboy and the Goon! What a great combo and I love them both! SAUL my man. tried to PM you but your stuff was full the other day. hit me back up. did you want to take part sir? your answer better be yes. Okay, so as of now the HELLBOY/HULK story isn't happening because the artist for the short is otherwise busy and won't be able to finish it. It's probably a long shot to ask this, but still: are there any artists here who'd like to tackle an eight-page script featuring Red and Jade-Jaws? If you want to see the script before making a decision, let me know and I can PM it to you.